There's a new Legacy Family Tree user group in Qualicum Beach, British Columbia, Canada. Kathy Jones, coordinator of the group, reported that their first meeting was held on September 14 with 27 attendees. That's a great number Kathy, congratulations! If you're in the area (it'd be a 1,674 mile drive for me...), mark the 2nd Tuesday of each month on your calendar. Meetings will meet regularly from 9:30-11:30am at the Qualicum Beach Family History Centre at 591 Arbutus Road. Other Legacy User Groups meet around the world. Visit http://www.legacyfamilytree.com/UsersGroups.asp for the list. "Could a global functionality be added to the Master Location List allowing all of the GPS coordinates to be added at the touch of a button?" Great question Frank. Frank's question has some big implications. First, your Master Location List is a list of all locations you have entered into your Legacy family file. If a location has been "geo-coded", when clicking on it in the list, its map will instantly be displayed (as long as the "Show Map" button is checked and you are connected to the Internet). See what it looks like below. Make sure that the "Show Map" option is turned on. Then click on the Geo-code button in the upper right. Click on the second option: "Geo-code all un-resolved locations..."
At the end of the process there will probably be some locations with a question mark (?) in the "L" column (just to the right of the name of the location). This means that Legacy was unable to automatically geo-code that location. In these cases, click once on the location and you may be presented with a list of possible matches. Select the appropriate one and verify that the place is correctly plotted on the map. Advanced tip: if, for some reason, the place on the map was not correctly plotted, just right-click on the map where the place should be, and Legacy will update the geo-code information. The map will then correctly be displayed in the future. A free update is now available for the Families iPhone/iPad/iPod Touch application. Version 1.1.0 adds a new Descendant View, support for display and editing of privacy fields, and fixes a problem with adding a second husband. Families lets you view and edit your Legacy Family Tree family files on your mobile iDevices. For more information, click here. October 2010 is our busiest month ever. We'll be involved with genealogy seminars in Arizona, California, Idaho, New Zealand, Utah, and online in 2010's last quarter. We hope to see you in person or online! USA | Arizona | Youngtown - October 5/12/19/26. West Valley Genealogical Society. This is a four-week Advanced Legacy course taught by Legacy's Geoff Rasmussen. Pre-registration is required, and seating is limited. Visit http://www.azwvgs.org/Classes.htm for more information. Online webinar - October 6. Helping Unlock the World's Records - An Insider's Perspective on FamilySearch Indexing presented by FamilySearch's Jim Ericson. 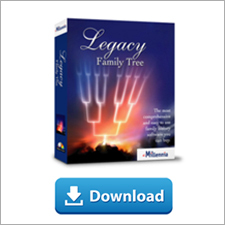 For more information and to register (free) visit www.LegacyFamilyTree.com/webinars.asp. The live webinar begins at 2:00pm Eastern time. USA | Utah | Bountiful - October 6. South Davis Family History Center (3350 South 100 East in Bountiful) will teach "New FamilySearch Made Easy with Legacy Family Tree" starting at 6:00pm. For a class schedule and map click here. USA | California | Pleasanton - October 8-9. California Family History Expo 2010. Held at the Alameda County Fairgrounds (4501 Pleasanton Ave), visit with Legacy's Ken McGinnis and Geoff Rasmussen. In addition to our seminar-special-pricing on Legacy products, we will be giving away a netbook computer as a grand prize. Geoff will also be teaching 1) Research Guidance tools, 2) Mapping for Genealogists, 3) Sharing Genealogy Electronically, and 4) Blogging for Genealogists. For more information, click here. USA | Utah | Saratoga Springs - October 15-16. Eagle Mountain and Saratoga Springs Stakes Family History Seminar. Leonard Plaizier will teach: 1) Legacy Family Tree - FamilySearch Made Easy, 2) Research Guidance - Automated Research Helps, 3) Getting Started - an Overview of Legacy. Click here for more information. USA | Idaho | Coeur d'Alene - October 16. Hayden Lake Stake's annual Family History Seminar. Legacy's Luc Comeau will teach two Legacy classes. 9:00am-3:00pm. Held at 2293 W. Hanley Ave in Coeur d'Alene. USA | Utah | St. George - October 16. St. George Regional Family History Training Center located across the street from the St. George LDS temple. This is an all day Legacy class of approximately eight hours. 9:00 am - 5:00 pm. In addition to the demonstration of how to use Legacy, students will also have hands-on practice along with assignments and handouts to best learn the software. Registration is open to anyone. Contact David Midgley for more information or call the FHC at 435-673-4591. USA | California | Mission Viejo - October 16. South Orange County California Genealogical Society. Come to the Legacy table, where Legacy user, David Flint, will be demonstrating Legacy and answering your questions. For more information, please click here. Online webinar - October 20. Blogging for Beginners presented by DearMYRTLE of DearMYRTLE's Genealogy Blog. For more information and to register (free) visit www.LegacyFamilyTree.com/webinars.asp. The live webinar begins at 8:00pm Eastern time. USA | Utah | St. George - October 20-22. St. George Regional Family History Training Center located across the street from the St. George LDS temple. This is a 3-session Legacy class of two and a half hours each day. 10:00-12:30. In addition to the demonstration of how to use Legacy, students will also have hands-on practice along with assignments and handouts to best learn the software. Registration is open to anyone. Contact David Midgley for more information or call the FHC at 435-673-4591. USA | Utah | Salt Lake City - October 22-23. International Commission for the Accreditation of Professional Genealogists (ICAPGen). Visit with Legacy's developer and vice-president, Ken McGinnis at the Legacy booth. We will also be teaching two classes on using Legacy. More information to come. Visit www.icapgen.org for more information. USA | Utah | Provo - October 24. BYU Family History Center. Haybron Adams will teach "Legacy and New FamilySearch." For more information, please click here. Online webinar - October 27. New Family History Technology. There are so many new family history tools and web sites…it’s easy to feel somewhat overwhelmed. Here’s a colorful tour of much of the new stuff to make it easier, save you hundreds of hours, and have fun connecting to your ancestors. Learn about the best of the Internet, free websites, and unique resources. Join the author of the book Crash Course in Family History, Paul Larsen, and see what you’re missing! For more information and to register (free) visit www.LegacyFamilyTree.com/webinars.asp. The live webinar begins at 9:00pm Eastern time. Online webinar - November 3. Organize, Share, and Publish Your Digital Photos with Heritage Collector Suite presented by Marlo Schuldt. 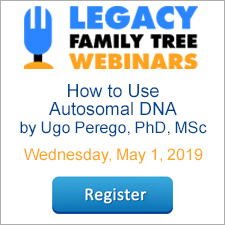 For more information and to register (free) visit www.LegacyFamilyTree.com/webinars.asp. The live webinar begins at 9:00pm Eastern time. USA | Washington | Bellevue - November 6. Redmond and Bellevue LDS Stakes Family History Expo 2010. Held at the Bellevue LDS Stake Center at 14536 Main Street. Legacy's Jim Terry will teach "Introduction to Legacy Family Tree 7.5 and New FamilySearch." Click here for more information. Australia and New Zealand - November 8-21. 7th Annual Legacy Genealogy Cruise. Click here for more information. USA | Arizona | Parker - December 10. Bouse Genealogical Society Genealogy Technology Conference. To be held at the Blue Water Casino, 11222 Resort Dr., in Parker. Featuring Legacy's Geoff Rasmussen. Topics are: Research Guidance: GenSmarts, Family Search and Legacy; Mapping your Ancestors Electronically; Insider’s Guide to Legacy Family Tree; and 12 Step Checklist to using your Genealogy Computer Program.. Cost is $25/members and $30/non-members. Additional information and registration form are available at http://bousegenies.weebly.com (then click on 2010 Genealogy Conference) or send an email on our website at: http://bousegenies.weebly.com/. Join us for our next live webinar on Wednesday, October 20, 2010 at 8:00PM Eastern. The webinar, hosted by Legacy Family Tree, Blogging for Beginners will be presented by DearMYRTLE (Pat Richley), author of DearMYRTLE's Genealogy Blog. DearMYRTLE is the nom de plme of Pat Richley, a retired post-secondary computer software instructor. Since 1995, Myrt has provided practical, down-to-earth advice for family historians. She is the author of DearMYRTLE's Joy of Genealogy and numerous magazine and online articles focusing on beginning concepts. Find Myrt online at http://blog.DearMYRTLE.com, and as Clarise Beaumont in Second Life. Myrt is currently working on a blog and a book about her friend Elsie's experiences in the American Red Cross in England, France, and Korea during WWII and in Japan during the Korean conflict. Registration is free but space is limited. Click the registration button below to reserve your webinar seat. In just over a month our 7th annual Legacy Genealogy Cruise will begin. Departing from Sydney, Australia on November 8, we will visit eight New Zealand ports and enjoy four days of Legacy classes while at sea. This year's class lineup will feature five different speakers - all with classes that everyone will love. As always, we'll have a great syllabus for everyone. See you in November Australia and New Zealand! "Daddy, I know why they put numbers on houses. It's so the GPS will know how to get there." Join us for our next live webinar on Wednesday, October 6, 2010 at 2:00PM EDT. The webinar, hosted by Legacy Family Tree, Helping Unlock the World's Records: an Insider's Perspective on FamilySearch Indexing will be presented by Jim Ericson, product marketing manager at FamilySearch. Learn how the world’s records are made searchable and available online through FamilySearch indexing. This class will discuss the origins of FamilySearch indexing, the purpose this service fulfills, the benefits of becoming an indexing volunteer, and tips and tricks that will make the time you spend indexing more productive and fulfilling. More than 126 million records have been indexed in 2010, but it would take nearly 300 years to index all of the records available today at the current rate (not to mention the millions of additional records that become available every year). Learn how you can get involved in this monumental effort that helps others identify and document their ancestors. Jim Ericson has more than 13 years of experience combining his interests in technology and genealogy to launch new products and services in the genealogy community. Jim is currently a product marketing manager at FamilySearch, where he encourages participation in online volunteer efforts, including FamilySearch indexing, and the FamilySearch wiki. Jim previously worked as marketing vice president for FamilyLink.com and OneGreatFamily, where he led efforts in interactive marketing, brand development, marketing communications, and strategic relations to define and market online genealogy subscriptions. He also worked for four years as a product marketing manager and marketing director for Ancestry.com. After you register you will be sent instructions, including your private link to view the webinar online. You will need to be connected to the Internet (high speed connection recommended) and turn on your speakers. Be sure to join about 15 minutes prior to the start time to ensure everything is working correctly. Also be sure to correctly calculate your time zone. Today's live Mapping for Genealogists webinar is now complete. We had a great turnout and for the most part the technology worked well. I think the biggest challenge we faced was the "what time zone am I in?" challenge. It was live beginning at 2:00pm Eastern Daylight Time (EDT) but we will certainly try to make this more clear for future webinars. There were a bunch of dedicated Australia listeners who started their day at 4am. Great to have you all there! For those who missed the live webinar, we did record it. Go to www.LegacyFamilyTree.com/webinars.asp for the recording. We did no editing to the video (all the dumb jokes are still there, sorry...). It is 1 hour 12 minutes in length. As a reminder, the coupon code we issued expires this Saturday, September 18. The code is available at the 1 hour 10 minute mark in the video. And congrats to the door prize winners Joseph Batty (won AniMap 3.0) and Liivi Murumets (won Centennia mapping software). There were a number of questions that we did not have time to personally address in the webinar, but we still have the list. We'll hopefully either respond privately or via an article here sometime soon. We've got some great ideas for future webinars. We even announced our next webinar for October 6. See our webinars page for more information and to register. I will write more about it soon. If you have an idea for a webinar, let me know. We would even entertain the idea of providing a free webinar for your local Legacy User Group or genealogy society. Now that would be fun! Just in time for Wednesday's Mapping webinar, AniMap 3.0 is now available for the first time as a downloadable product from our online store. To watch a brief video on AniMap, click here.